Juliet Coombe discovers how Welawaya is leading the way in reviving historic varieties of rice for a better way of life. In the ancient kingdom of Anuradhapura, the kings grew rice with no chemicals or fertilisers, other than natural manure, and were more interested in the health of their people, who built the huge interlinking tank system that still feeds the paddy fields and spawns the large bio-diversity of animals to this day. The rice of that period was famous for combatting cholesterol, diabetes and for feeding newborn babies, as it helped build strong lifelong immunity and incredible strength in the people. The green revolution in Sri Lanka changed everything in the 19th century, when cloned rice varieties were grown commercially to obtain larger yields, but the plants’ vigour quickly declined and left the new varieties needing extra support. So, the farmers were forced to boost growth with fertilisers and introduce harmful insecticides to fight certain pests, which have crept into the food chain. Unlike natural fertilisers such as horse, cow and bird dung, artificial fertilisers have introduced serious problems to the island’s staple crop. 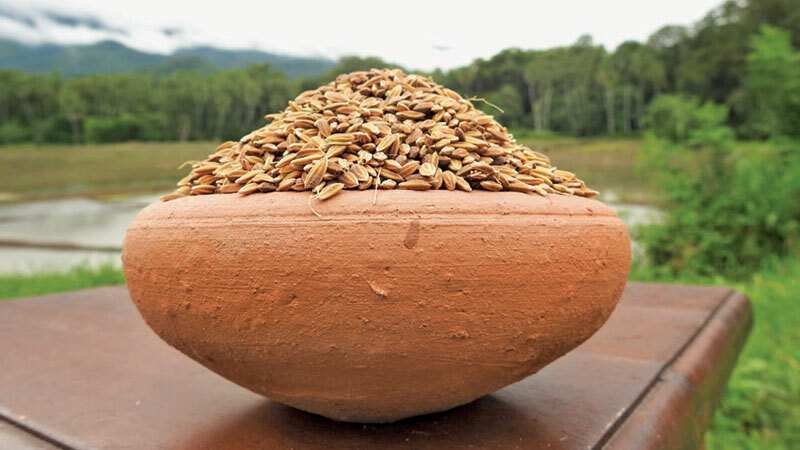 Historians say there are more than 300 hundred ancient rice varieties and one of the best is Pachchaparumal (often described as Lord Buddha’s rice), which, although very heavy, owing to being full of nutrients, is lower in carbohydrates, contains antioxidants, zinc, magnesium, Vitamin B, and also stops diseases like diabetes and cholesterol. However, Suwanel rice is popular among Sri Lankans as the grain is smaller, cheaper and not so heavy and, owing to economic constraints, people are now more price conscious than health conscious, leading to massive increases in diabetes and kidney problems. This is, of course, a false economy as good health is priceless. Rice is the most important crop in Sri Lanka and the great kings of the past significantly improved paddy field cultivation, which, combined with the excellent tropical growing conditions, earned the island a reputation for centuries as the ‘Granary of the East’, with some 1,000 indigenous rice varieties being grown, much of which were sold to the rest of the East. The Great King, who was knowledgeable in the medicinal benefits of all plants and the importance of respecting every aspect of nature, told the people not to waste even a drop of rainwater and as a result built the big tanks, still operating a thousand years later, to save the water for paddy cultivation and nature that always flourishes in the areas they were built. I learn, as I walk along the paddy field crop dividing lines, how rice has been part of the culture in Sri Lanka, since 800 BC, and this is why it is known around the world as the home of rice cultivation. Because of this, we can use the traditional knowledge, passed down through generations, to solve not only our peoples’ own medicinal challenges but also our guests, so they understand how we are what we eat. Ishanda explained, “When we use the old traditional farming methods, we can see it creates wider ripples across the land, with a greater range of bio-diversity returning to the paddy fields. I have seen birds like Greater Cookel and Pond Herron, which feed off insects and fish, return to the areas planted. The ancient paddy fields now also have six varieties of fish and five types of frog in the water, showing the area has become more bio-diverse and healthy, as we move back in time to stronger varieties of rice. This is essential, as we do not know how harmful the use of insecticides is, on our body’s long term health. The ancient methods of growing are also sustainable because they create jobs within the community, leading to a better community spirit, as local people are able to earn a living. Interestingly, the commercial rice farmers only get paid 35 rupees per kg for a variety that is not great for the health, while the farmers selling traditional ancient rice get 80 rupees per kg. So, they are better off, but the overall amounts produced are small as there needs to be a lot of education around healthy eating and paying more for food instead of medicine in the long term. Chemical fertilisers contaminate the ground water by introducing heavy metals, which cause many kidney problems in the intermediary area of the country and cause the fish to die, so nothing for certain birds to eat, which in turn creates other issues in natural life cycles. With the current emphasis on how much one makes over how much one creates towards a better quality of life, this direction will, unless changed, be the undoing of mankind. 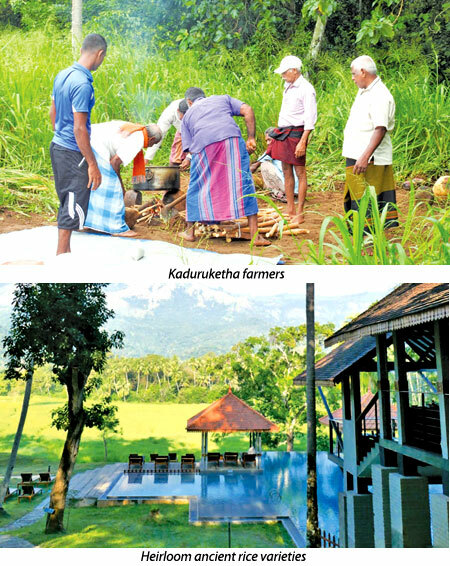 For securing the help of the spirit world, the 31 farmers in Jetwing Kaduruketha have a rice festival around the holy banyan tree where each of them contributes a kilo of rice from their paddy fields, which are combined with milk in offerings to guarantee a good harvest. The kapumatha comes along at 6am, as the chief prayer adviser, and prepares the oil lamp in the tree and trays of food offerings. He requests that the spirits provide enough rain for a good harvest and in return offers a basket of milk rice and fruits. The farmers also tie a small coin into their clothes and put it in the Banyan tree to make a wish for the family and the harvest. After this, all the families share the milk rice together. The ancient rice seeds are bought from Homagama and can be sown either directly in the ground after putting them in a weighted down bag in water under pressure for 48 hours, or sown in a nursery for 14 days and then planted in lines in the paddy fields. The ladies do the planting and sing loving folk songs as they go, which they believe helps the seeds grow from the love spread by the music. Once the seeds have grown, they have to manually weed around them twice in the three months before harvesting. Planting is in August and again in November and then harvesting at the end of February. The farmers caress the rice plants with their hands as they go home each night and one can feel the difference this makes in the rice from plot to plate. The feeling for the land is infused in the dishes created and as the use of heirloom rice grows and helps those with kidney issues get better one can only pray that we can return the world to a better way of life.